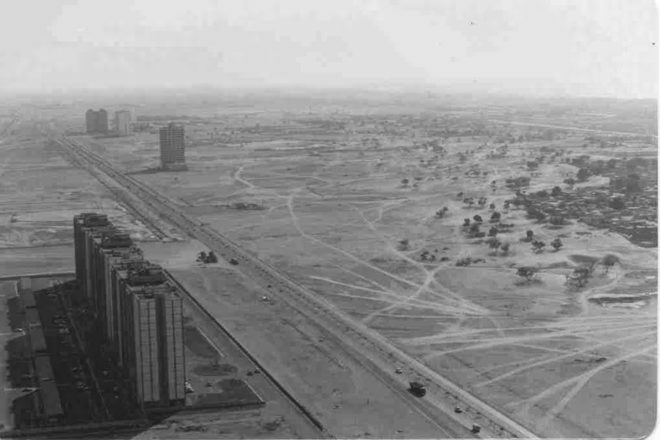 Dubai in the early 1990s with Sheikh Zayed Road. The vast growth and development of Dubai can be best seen by comparing images of the city 25 years ago and now. It’s a mixture of homely comforts, extravagant living and the exotic, Dubai has become a popular – and safe – Middle East destination for travellers. The city was a humble pearl-fishing village until the discovery of oil in 1966 which triggered a massive influx of foreign workers – and the formation of the United Arab Emirates in the 1970s leading the city to growth beyond recognition. Astonishingly, the picture to the right was only taken in the early 1990s and shows the Sheikh Zayed Road, the longest in the UAE starting in the heart of Dubai and stretching to the border of Abu Dhabi. The road was named after former president Sheikh Zayed bin Sultan Al Nahyan who was the driving force behind the formation of the UAE. Today, just two decades later, the same road is lined with flashy skyscrapers and outstanding infrastructure, connecting new developments along the Arabian coast, such as the world-renowned Palm Jumeirah, Dubai Marina and Dubai Waterfront. With seven-star properties, the world’s tallest tower, underwater hotels and man-made islands, Dubai is an intriguing contradiction of Middle Eastern traditions and a glitz-and-glam way of life. Dubai has exploded onto the travel scene as a somewhat outrageous, yet must-see (and tax-free) city. And, with Qantas’ global aviation partnership with Emirates and the introduction of daily flights to London via Dubai from both Sydney and Melbourne from 2013, Australians can expect to see a lot more of Dubai.